Join OOSS for Symposium 2018. The meeting will explore essential drivers for success that set the stage for effective and adaptive succession planning and implementation in these times of economic and social turbulence and opportunity. Three-track program for Physicians/Owners, Administrators and Managers, and Directors of Nursing/Clinical Staff examines pre-emptive drivers for oASC success. Maria C. Scott, MD, founder and medical director of Chesapeake Eye Care and Laser Center and medical director of TLC Laser Eye Center Annapolis. Maria serves as the president of OOSS. Keith Liang, MD, founder and medical director of Sacramento Eye SurgiCenter, affiliated Center for Sight eye clinic and laser center. Keith serves on the OOSS Board of Directors. Ralph Chu, MD, founder and medical director of Chu Vision Institute and Chu Surgery Center. Ralph is a past president of OOSS and current chair of government relations. Cathleen McCabe, MD, medical director of Eye Associates Ambulatory Surgery Center. Cathy serves as vice president of OOSS and is an AAO Councilor representing the members of OOSS. Maureen Waddle, MBA, principal and senior consultant, BSM Consulting. Stephen C. Sheppard, CPA, COE, managing principal, Medical Consulting Group. Todd Albertz, Vice President of Surgical & Specialty Services, Cincinnati Eye Institute. Todd serves on the OOSS board of directors. Dan Chambers, MBA, Chief Administrative Officer of Key-Whitman Eye and Surgery Center. Regina Boore, MS, BSN, RN, CASC, senior VP and executive consultant for BSMs Progressive Surgical Solutions division. Nikki Hurley, BSN, RN, MBA, director, Key-Whitman Eye and Surgery Center. Nikki serves on the OOSS board of directors. Maria Tietjen, RN, BSN, CSPD, VP clinical and nursing services, American SurgiSite Center. Maria serves on the OOSS board of directors. Patricia Thomas, RN, BS, CRNO, consultant for Medical Consulting Group. Keynoting and moderating this timely plenary session will be Bruce Maller, Founder and CEO of BSM Consulting. 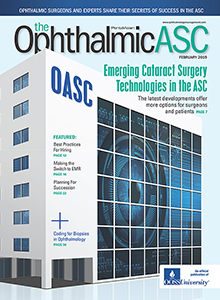 Bruce engages a following cast of ophthalmic ASC leaders to share their vivid stories of succession, including exploration of established and emergent options for ownership, investment, management, mergers and acquisitions.